From time immemorial have the friends and enemies astonished at the Russian people’s survivability. The skills of survivability in different crisis situations have been handed down from generation to generation. Perceptual unity of the world and human in it – as part of wildlife – allowed our ancestors to find the way out of any dangerous situation in time of peace and war. Traditions lived in the folk; they were preserved by the people who lived in harmony with nature. In most cases they lived far from the crades of civilization. While the «wild» citizens treat the nature as consumers, considering human to be the king of the nature. And only then everything clicks into place when a churl and arrogant man – a child of technological development – faces the nature itself. In this case one feels himself to be confused and helpless child standing on the brink of a precipice. But centuries-long experience of our ancestors was wasted as civilization came. In most cases our contemporaries don’t consider themselves to be part of the nature; they lost the survivability skills that were natural for our ancestors. But life didn’t become easier: apart from natural calamity there are ecological catastrophes and stressful situations caused by complicated social environment. It’s not difficult to guess what the role of the hand-to-hand fighting in the art of survivability is. 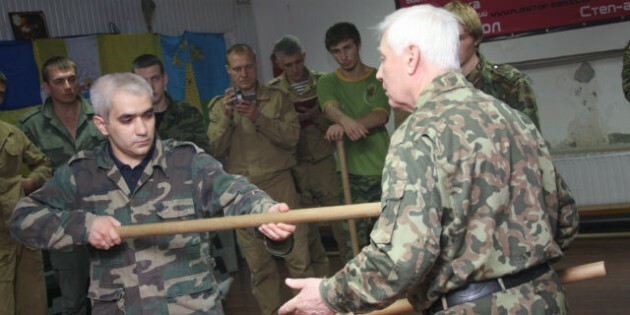 Of course, the level of mastering «invisible weapon» equates with the measure of professional risk. The training of professionals in this area and nonprofessionals is very serious. In special educational institutions it’s always paid attention to. This is the history of our homeland: the secrets of survivability have been preserved and multiplied either in the families (that is a real rarity) or in secret special services. But sometimes it happens in life when it’s necessary for people – representatives of peaceful professions – to take care of their personal security. Unlike sport which exists for beauty, gambling and learning of human abilities the hand-to-hand fighting is intended for preserving human life in a crisis situation. The real close fight happens not in the comfortable atmosphere of a gym, it can happen anywhere: during the day or night, in summer or winter, on slippery ground while raining or in unfixed sand, in clothes which in most cases isn’t good for hand-to-hand fighting, in the forest, narrow lift cabin or passenger compartment. The fighting can be not only individual but massive as well; it can be close or long-range fighting. Karatekas, for example, try to avoid close fighting. Thanks to the high amplitudes of the movements the fights of «eastern fighters» are spectacular. But this work requires excellent physical training that is impossible for most people. The fighter can be ill or injured. In combat conditions a person has to fight without mental or physical warm-up. Moreover, he has to fight being tired or injured, with fractures and brain concussion. It’s very important not to expend all the energy while fighting as in sport. You should try to preserve it as long as you can because you will need it to survive and after the victory if necessary you should be able to dress the wounds, get out of trap and wait for help. Arms, legs and any kind of weapon the hand-to-hand fighters use as leverages. If you handle the Russian style fighting system you’ll be able to control in close fighting the one who will attack you. 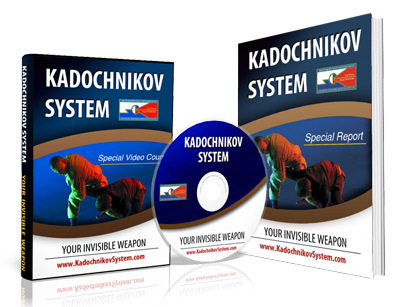 The aggressive energy turns against the one who is attacking and he is forced to obey the will of a person who uses the secrets of Kadochnikoff Style. In fact even pupils know these secrets. Open physics (the eighth grade) and you’ll see these «magic» leverages that are used by hand-to-hand fighters. The problem is that our secondary and higher education have nothing with real life. Very often pupils and students want nothing but to get a diploma. They learn a formula or law of nature, get a pass and forget about it. The young people get a great deal of passive knowledge about the world where they live but they don’t get the perceptional unity of the world. That’s why most of us become helpless in a crisis situation – all the knowledge in physics, chemistry, astronomy, physiology and other disciplines doesn’t help because all that you remember is a formula written in a copy-book. This knowledge wasn’t applied practically. That’s why those who want to handle «invisible weapon» will have to use not only their muscles but also their brain: they will have to learn text-books as much as train in a gym. Very interesting, I have a particular interest in working with mentally / physically disadvantaged individuals so am eager to learn as much as possible.